Blogmutt is at its heart a literary undertaking. Now we understand better than anyone, the posts we write for our business clients are not Hemingway, they aren’t poignant or symbolic. They just paint a picture. The picture they paint is for two basic audiences. The first is the customer, or potential customer. People so often look at web pages just to make sure that a business is a functioning and vital. A current blog does just that. The second audience, of course, is Google. The thing is, you can’t trick Google the way you could in the old days. What Google wants, say all the best experts, is for you to build a brand. For both of those audiences the way that a business can paint a picture is with words. I’ve been a fan of words for a long time. Before I was an entrepreneur, I was a writer. As a writer who started writing before the Internet really became useful, I started using dictionaries to help me in my writing. I got to really like them, and discovered that I liked having them around. So I started collecting them and before long I had dozens, and then hundreds. People looked at me oddly when I told them that their dictionary reflected poorly on them. I used to hang out at the only bar in Denver with no TV, and so we’d get into discussions which would lead invariably to fights over the meanings of words. The bar had a dictionary for just such occasions, but it was a crappy old “Websters” that just wasn’t up to the task so I bought a second edition of the best dictionary for modern use in the United States, the American Heritage Dictionary. So when our new Head of Awesomeness suggested that we should do something useful and fun in our social media streams AND do something that takes advantage of our new office with windows that face Walnut in a popular part of downtown Boulder, we started bouncing around the idea of doing something like a Word of the Day feature. There’s plenty of those, however, so I suggested that we take it up a notch, and do a Word of the Day from a Dictionary of the Day. I have plenty of dictionaries, and the dictionaries have plenty of words. Word Of the day from the dictionary OF the day, or WOOF! See that? A bit of doggy goodness thrown in there, no extra charge. But what a to use for our first word? And the first dictionary? The dictionary question was easy, my favorite: The American Heritage. It might have been the Oxford English Dictionary, the OED — I have the big one-volume version, the one that comes with a magnifying glass. But it’s at home and I’m at the office so American Heritage it is. The aforementioned OED is often cited as one of the earliest examples of crowdsourcing. The way the OED works is that it has definitions, but then it also has citations of how words have appeared in literature going back as far as they could figure out. Doing that for thousands of words was a big task, so they asked for help from a crowd. There’s a great book about all that, The Professor and the Madman. 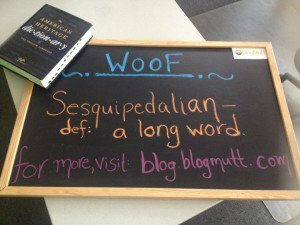 Chapter 4 of that book begins with the word sesquipedalian, which takes its roots from sesqui meaning “1.5” and ped meaning “foot” and so it means, literally, “having to do with things that are a foot and a half long.” The usage dates, according to the OED, back to 1615 to mean long words. He thought fit by his variety, to make you knowne for a viperous Sesquipedalian in euery coast. No idea what that means but it sounds cool. Anyway, it was only by using a crowd of workers that the OED came together, and that — combined with the British Navy — is a big part of why English is as much of a universal language as we have. These usage notes can be fun. Talking about this in the office we corrected one Blogmutter who thought that inflammable meant “can not be burned.” Here’s the usage note in the printed dictionary, which is way better than the bland but clear one online now. For best effect, read this out loud, with emotion! Historically, flammable and inflammable mean the same thing. However, the presence of the prefix in— has misled many people into assuming that inflammable means “not flammable” or “noncombustible.” In the circumstances, it is therefore advisable to use only flammable in context imparting warnings on product labels, where a misinterprtation might have more serious consequences for the reader than an etymological mistake would deserve. In other words… Dictionaries and clear writing can save lives! Our goal is to put one word on our new chalkboard every business day here at the Blogmutt World Headquarters, so you can walk by and soak them in. And if you don’t happen to live or work in the town lovingly referred to as the People’s Republic of Boulder, we’ll take a picture and get the word up on all the social media spots you might expect. Our office is at 1023 Walnut Street. We hope you enjoy reading this as much as we expect to enjoy bringing it to you each day.